Do you ever see a sewing pattern and think to yourself, “I have to have it”? That was my reaction when I first saw Butterick 9561. I didn’t care that it was probably impossible to find, I didn’t care that it would probably cost a million dollars to buy from somewhere, I had to have it. The problem with that plan? it wasn’t for sale anywhere. 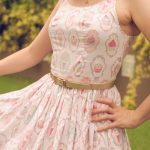 I posted a plea to my favourite sewing group to see if anyone out there had a copy, and much to my surprise, someone came forward. It ended up not costing me a cent because we did a pattern swap. 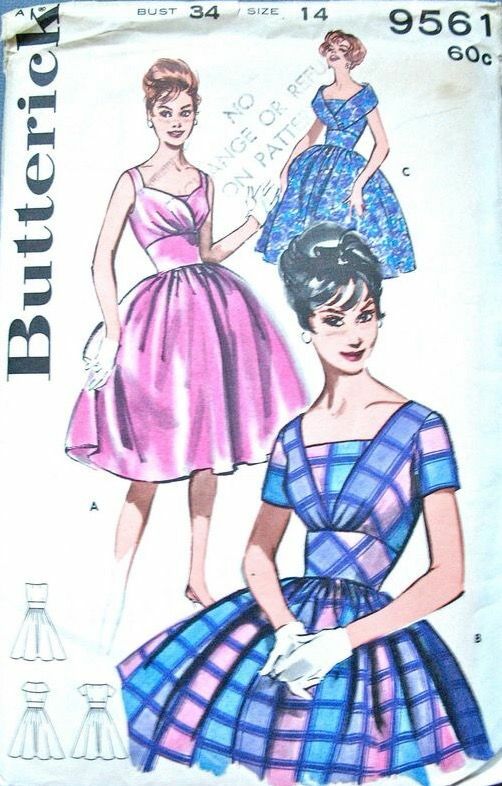 I had a stack of 1950s children’s patterns that I didn’t want, and she had a daughter who wanted new dresses. It was the perfect match. 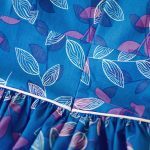 To this day, pattern swaps are still my favourite and I keep some rare but beautiful larger-sized patterns in a drawer somewhere hoping that someone will swap for their too-small 1950s patterns one day.. Wishful thinking. When it arrived… disaster. It was too big. Not one for grading patterns at that stage, I lamented this fact on Instagram (so close but so far! ), and someone messaged me. She had the same pattern but in a size too small for her. We traded tracings the very next day. 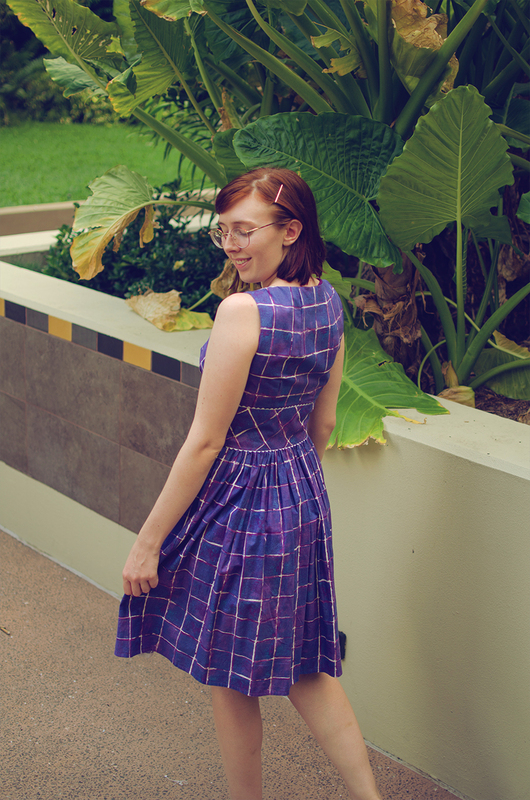 So this dress has been a long time coming, but it was such a joy to see it come together. The fabric could not have been more perfect. 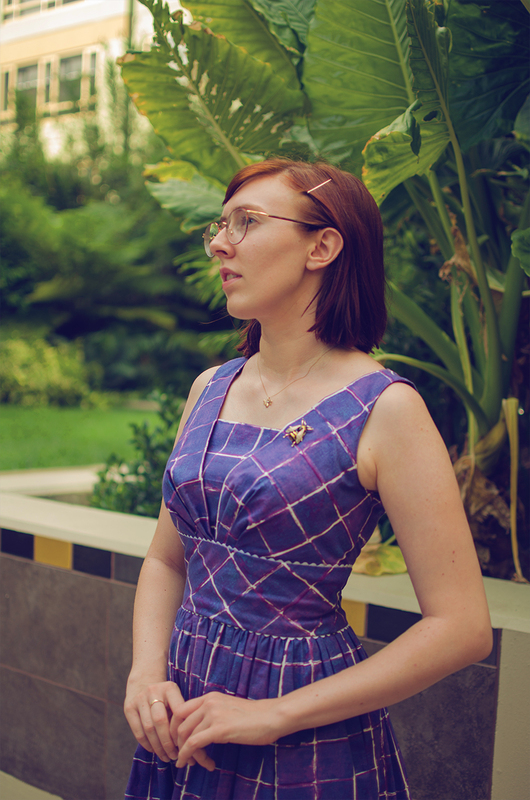 There’s something about grid prints that really appeal to me, and when I saw this print in East Coast Fabrics, I couldn’t resist. 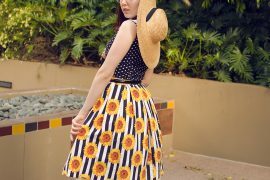 It’s from Melanie Testa’s Meadowlark range. You can find it on Etsy relatively cheaply, but I’m an avid shopper of the ECF sales so I got this one for $6 per metre. I bought the last bit on the bolt, which was, unfortunately, 20cm short of what I needed, especially with that annoying midriff section cut on the bias. I compensated with a bit of clever pattern placement and shortening the skirt. It’s still a fraction shorter than what I consider ideal, but I’m glad I went with the fabric anyways, it really was the perfect match for that pattern. I am fairly happy with the fit of this one but wish I had time to tweak it a bit further. I kind of started it on the day of a party and didn’t make a muslin. I didn’t end up finishing it in time for the party, either, so I just wasted a bunch of fabric on a subpar outcome for no reason, ugh! I shortened the straps because they were absurdly long, and the horizontal neckline under the surplus bodice was far too high for my liking. The instructions are also, quite simply, fucked. It has a lining in the front and a facing for the back neckline. It made me soooo mad because I hate messy insides and pride myself on making clothes that are as beautiful on the inside as the outside. I tacked everything down as neatly as I could by hand but I vowed never to follow instructions again, I will definitely line it next time around. On the bright side, the back is nice and breezy for what’s left of Summer! 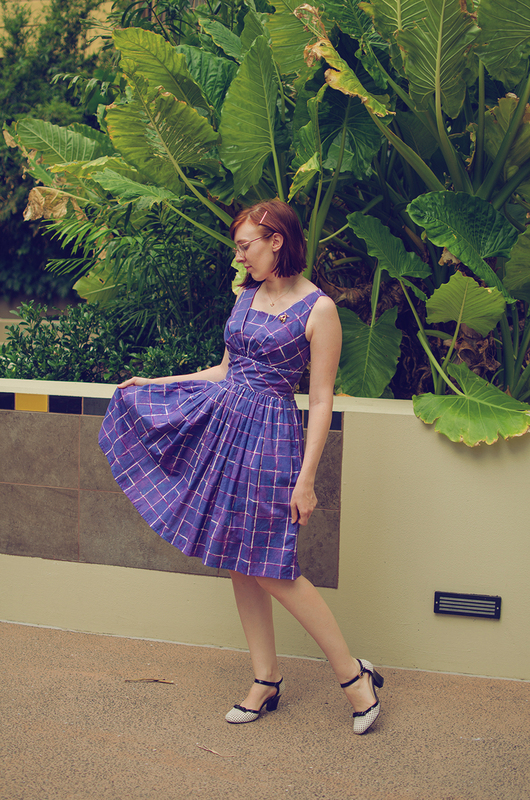 You certainly did find the perfect fabric for this one ;o) I remember seeing this one in your IG feed with Gertie! 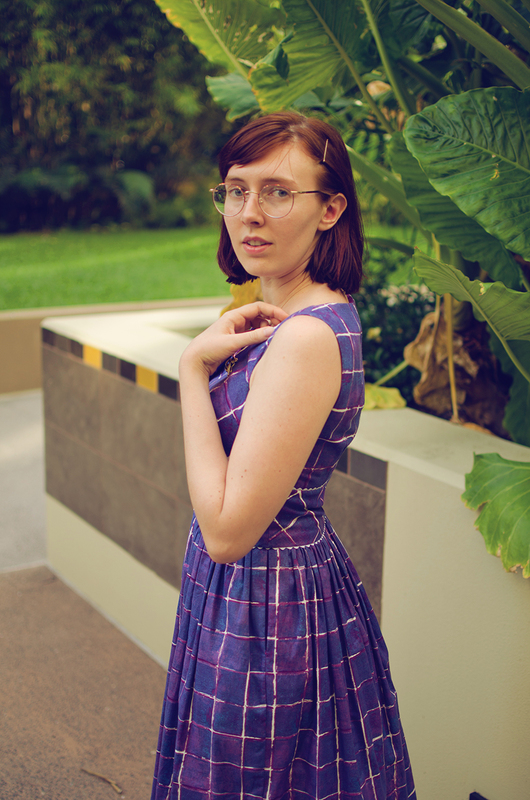 Yes, I’m trying to catch my blog up to my Instagram (to be fair, there’s not much to catch up on there because my hiatus was all-encompassing, haha) ;) Still one of my favorite dresses and thought it deserved a closer look!